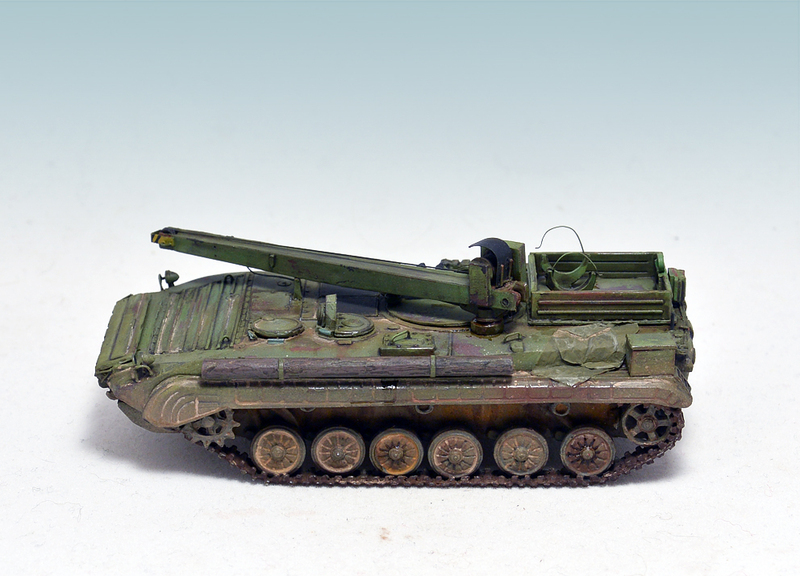 ARV-2 – Soviet Armoured recovery vehicle, created based on the BMP-1.ARV-2 is designed in Design and Engineering Center of the USSR Defense Ministry in Kiev. 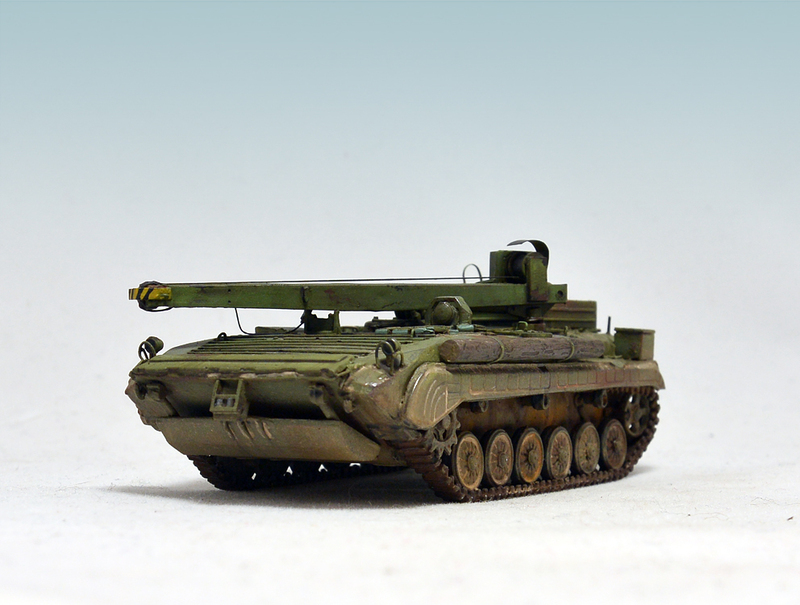 Issued on the basis of requiring overhaul of BMP-1.The machine is intended for emergency evacuation infantry fighting vehicles. This kit as all other kits of “ACE” very hard to assemble. Main problem is the amount of burrs and sink marks. The most difficult thing in this set is a truck. Because of the poor quality of casting has to mess that would free them from the burr. Eventually pulled from the kit all that I could. Add a little additions of tin, wire, etc. The model makes the old and used. 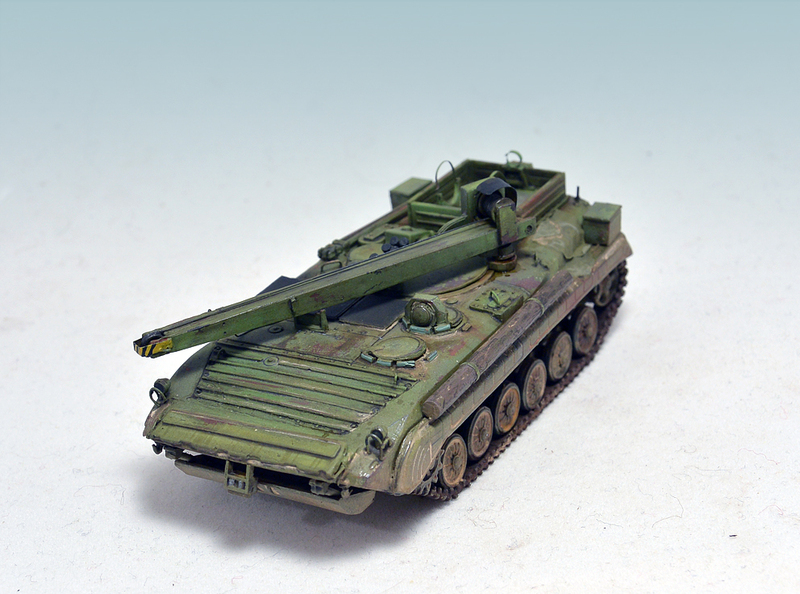 The model was painted with artistic acrylic paint , MIG pigments and artistic oil. 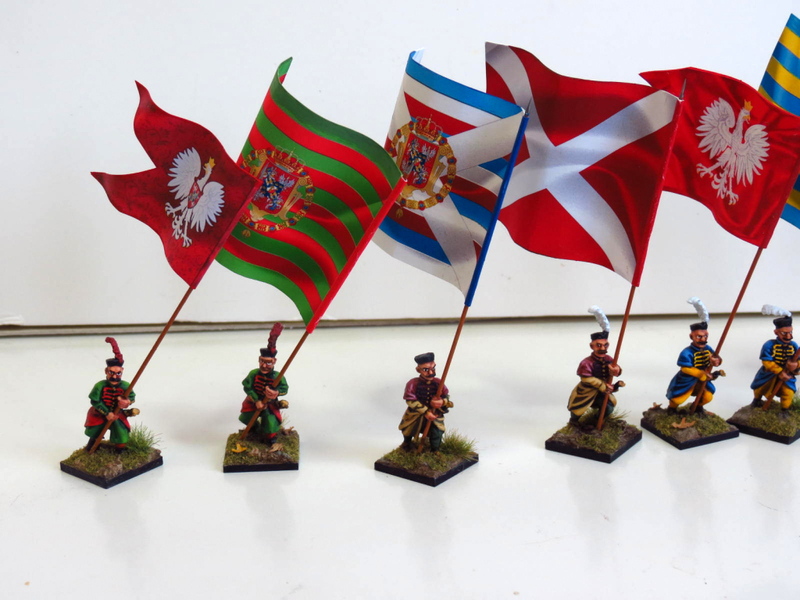 28mm – Polish Renaissance & Cossack Flags. 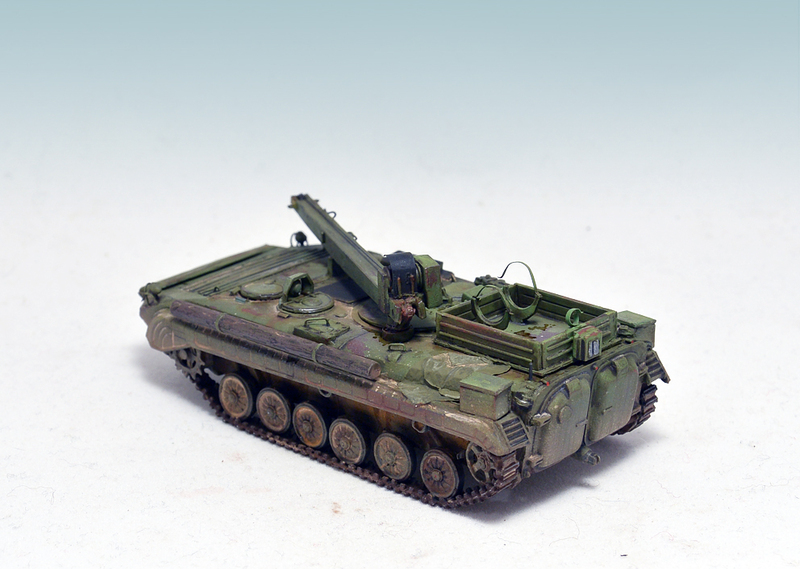 28mm The Assault Group – Foundry – Polish Renaissance Command. 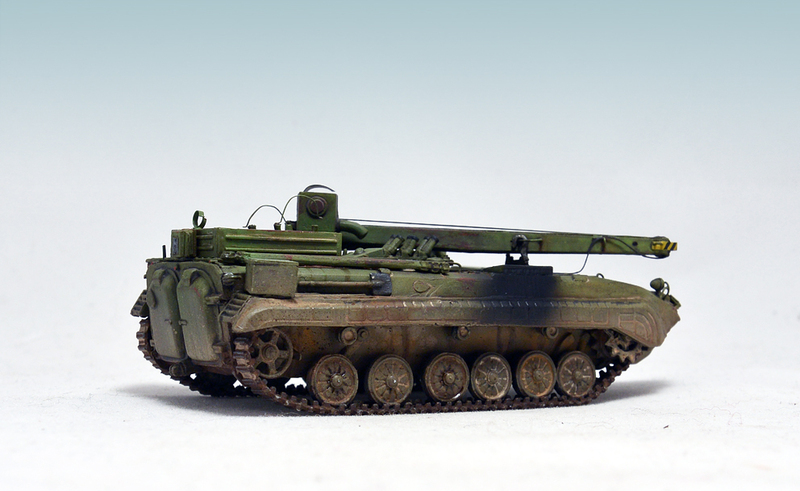 28mm – Polish Haiduks – Foundry & The Assault Group. 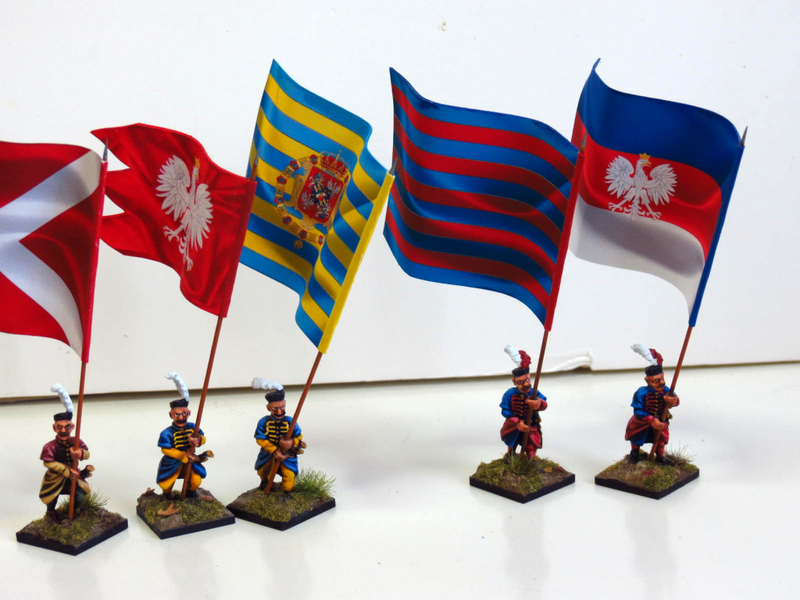 28mm – Polish Winged Hussars. 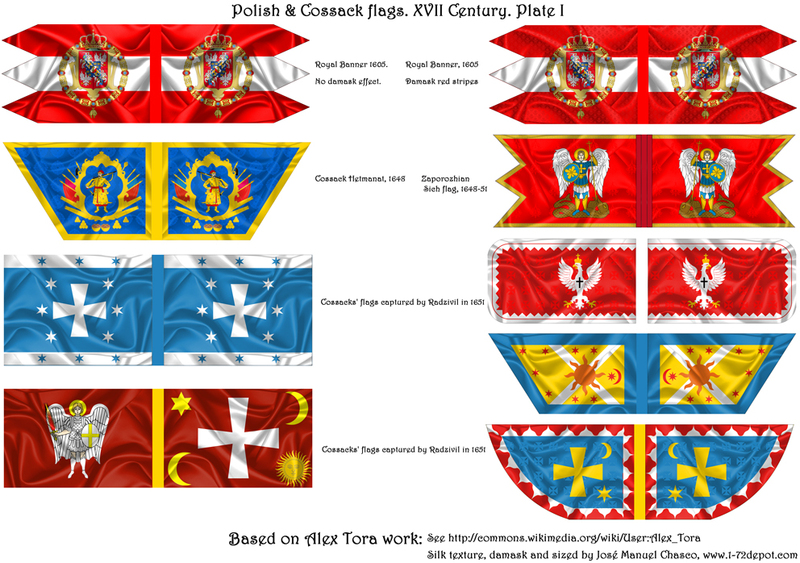 I was looking for some decent Cossack flags as well as some flags for my Haiduks regiments, but at the end i didn’t found any commercial ones of my taste. If you have been following my work for this period, you know i already used Battle-Flags.com ones but even if they are excellent flags, they don’t cover all my needs. 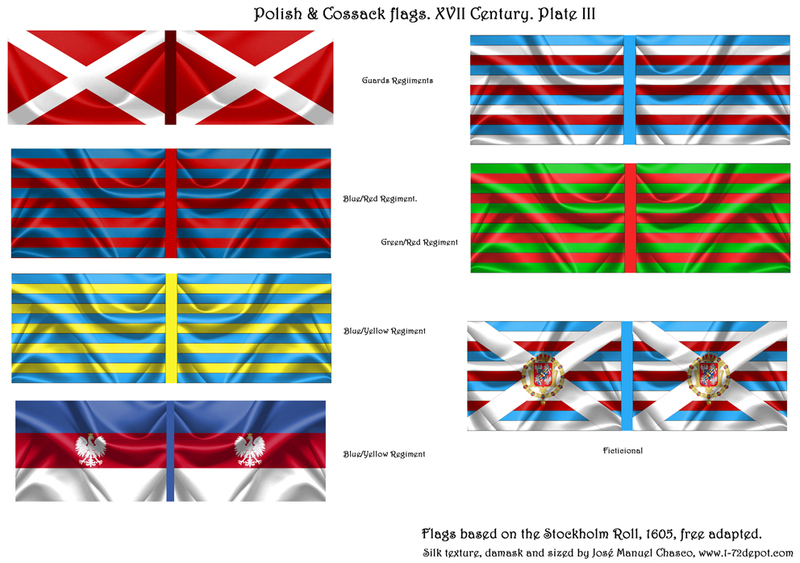 So, after some time looking for them, i committed myself to give a try to my skills with Photoshop, and i found on Wikipedia a great source of plain flags to work on it. Most of the work is based on Alex Tora work, but not only. After check all images copyrights, i’m allowed not only to use them but also to distribute my work, which hopefully will be used by other period enthusiast. 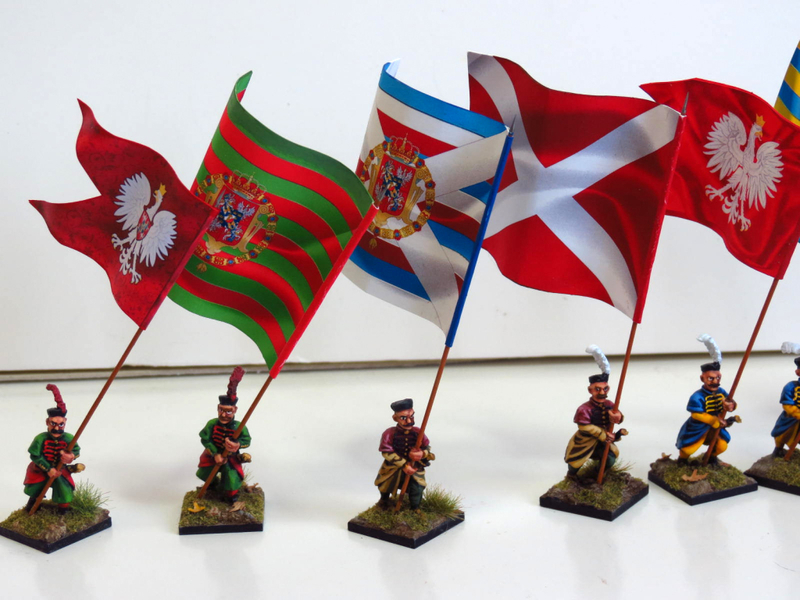 Remember always that flags are sized for 28mm figures. It’s possible to reduce and adapt them to 15mm, but if you try to make them bigger it can implies a quality loss. NOTICE: Find high resolution files links below, don’t print images showed here. I did 3 plates to full fill my needs. Maybe the mix on the plates haven’t much sense, as it’s a mix of Polish and Cossacks flags, but i did it just thinking on my needs, and not in distribute it. Chorągiew królewska króla Zygmunta III Wazy.svg by Olek Remesz, licensed under the Creative Commons Attribution-Share Alike 2.5 Generic, 2.0 Generic and 1.0 Generic license. Zaporozhian Sich flag.svg by Alex Tora licensed under the Creative Commons Attribution-Share Alike 2.1 Japan license. Flag of the Cossack Hetmanat.svg by Alex Tora released into the public domain. 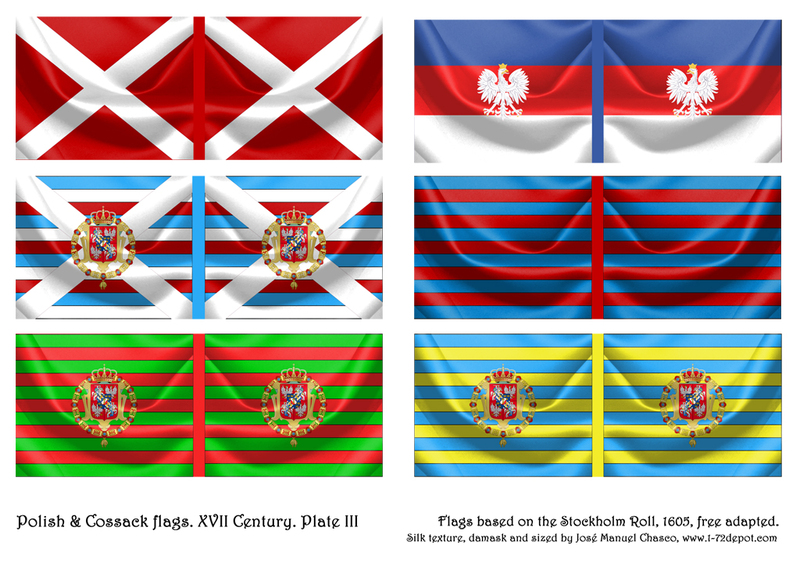 And five flags contained in Alex K Kozaks flags 1651-00.svg by Alex Tora picking up flags by flag from his gallery, licensed under the Creative Commons Attribution 3.0 Unported license. SEE COMMENT BY NORB BELOW, according to https://encyklopedia.pwn.pl/haslo/Orzel-Bialy;3952080.html the White eagle pattern i used doesn’t fit the period, as belongs to a more modern pattern. Sorry for the inaccuracy.
. This image is in the public domain according to Article 4, case 2 of the Polish Copyright Law Act of February 4, 1994 (Dz. 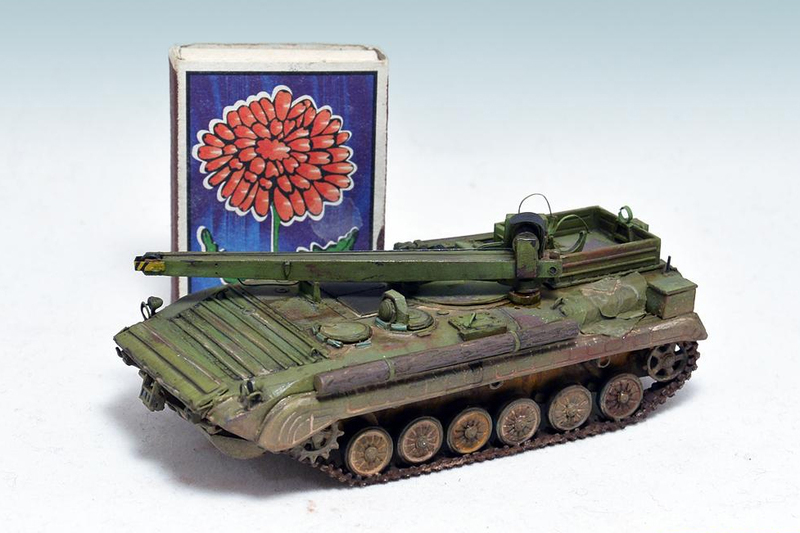 U. z 2006 r. Nr 90 poz. 631 with later changes) “normative acts and drafts thereof as well as official documents, materials, signs and symbols are not subject to copyrights”. Hence it is assumed that this image has been released into public domain. However in some instances the use of this image in Poland might be regulated by other laws. 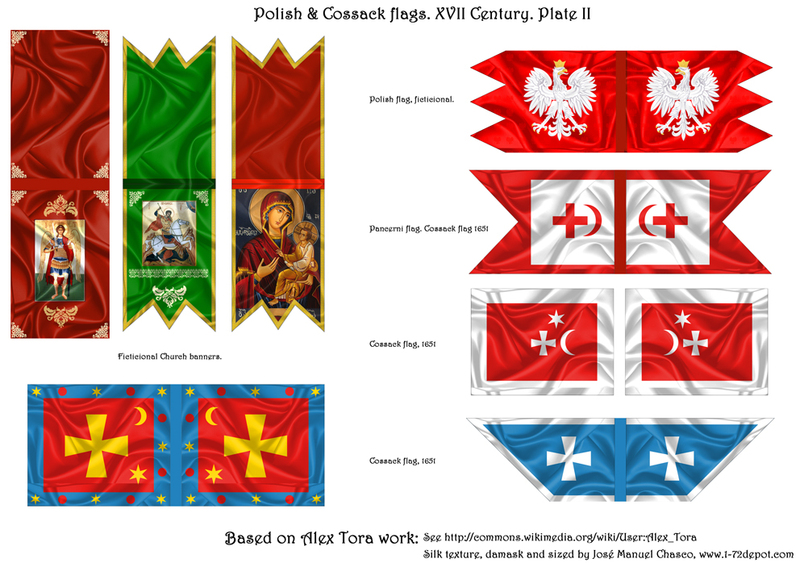 Four flags contained in Alex K Kozaks flags 1651-00.svg by Alex Tora picking up flags by flag from his gallery, licensed under the Creative Commons Attribution 3.0 Unported license. Two of the religious banners are using parts of Zaporozhian Sich flag.svg by Alex Tora licensed under the Creative Commons Attribution-Share Alike 2.1 Japan license. 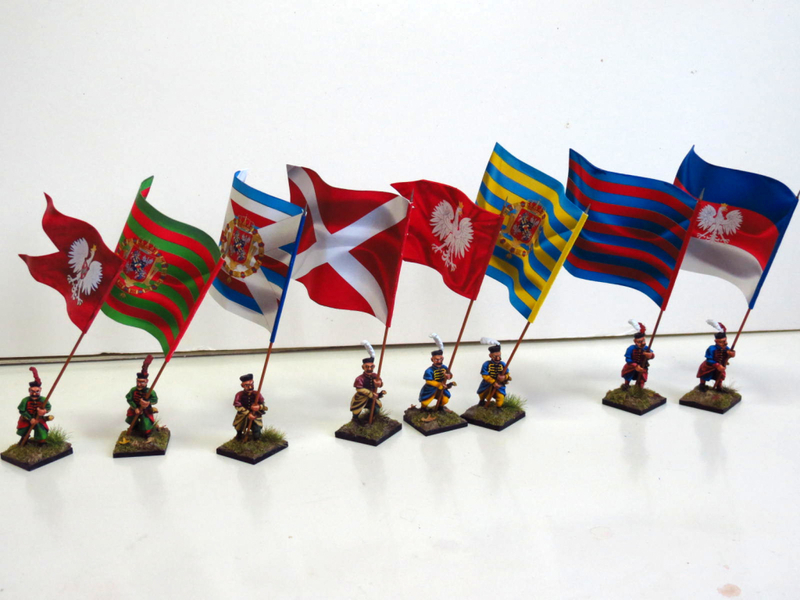 Changed some colours as well as size for these infantry flags, which should be bigger than cavalry ones. UPDATED 14/08/2014, png files changed to high resolution pdf for easier print. High resolutions files will looks too big if you open them in an internet browser or picture viewer, this is because they are coded at 300dpi resolution images. If you open them in a image editor program such Photoshop (Commercial) or Gimp (Free), you will find they are adjusted to full fill an A4 landscape orientation paper. If you go to a professional print centre they will know how to handle this. Cost to print one single page (full digital quality) should be around or less than 50 Euro cent. About the paper i recommend to you a matte paper, and as more slim as the printer can. Avoid thicker and brightness papers used in print centres, and ask him for standard paper, or best of all, archival matte paper (for ink-jet printers). If you plan to print yourself the flags, at home, i recommend to you the usage of the archival matte paper. It’s an inversion, but you can use this paper to print tons of flags, which surely you will need in the future. Some colour tones like blue or red vary from printer to printer, i adjusted tones used in the images for my printer. If you feel as wrong some of the colour and can’t change colour configuration in your printer, i can supply you original PSD files, so you can directly modify the image colours. Hope you find this useful, soon i will show how they look onto my Haiduks and then onto the Cossacks as soon as they will be available. And now how they look ! Mostly showed here Plate IV, at the end my Haiduks regiments have some flag. I used an old injected ink printer, with a special matte paper, at the end, i’m happy with final result, although it need several tries, printing from several programs. I used “photo quality” in the printer configuration. To save troubles to others i converted downloadable files to pdf format, which should works good for everybody. 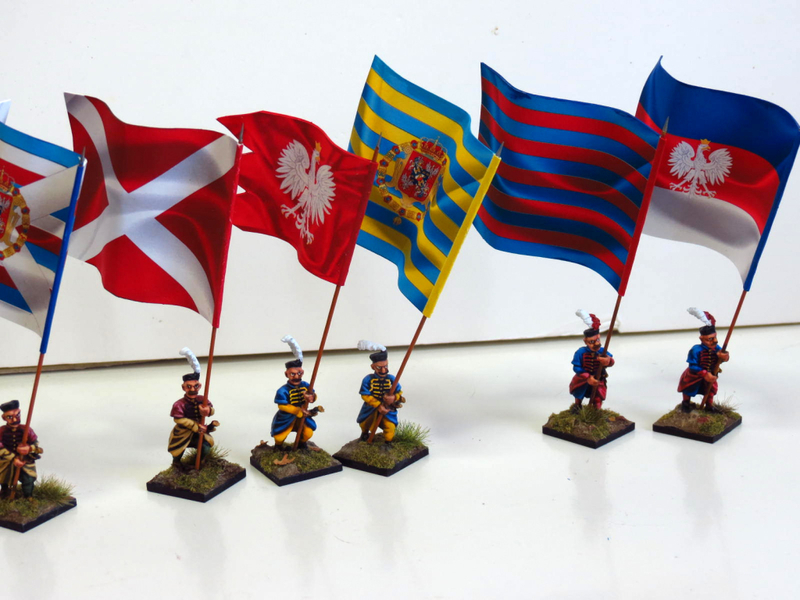 First flag on the left is not mine, it’s one of the flags purchased at Battle-Flag.com, good to compare quality and size of my own ones.